Anil Sharma has been under pressure from his own party after his father, former Union minister Sukh Ram quit the BJP and joined the Congress along with son Aashray Sharma. BJP's Anil Sharma has quit as Himachal Power Minister. 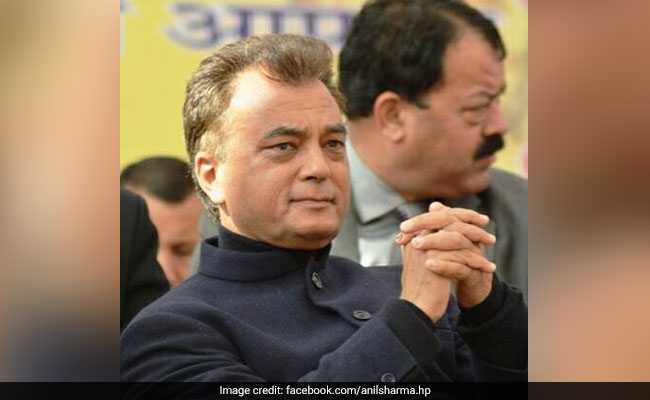 Himachal Pradesh Power Minister Anil Sharma resigned from the BJP government today, days after the Congress fielded his son Aashray Sharma as its candidate from the Mandi Lok Sabha constituency. Anil Sharma has been under pressure from the BJP after his father, former Union minister and chief minister Sukh Ram, quit the saffron party and joined the Congress along with Aashray Sharma last month. Speaking to news agency PTI after submitting his resignation to Chief Minister Jai Ram Thakur's office, Anil Sharma said: "I have resigned from the ministry. During a public meeting in my Assembly segment Mandi, the CM said I was lost somewhere and if someone knew about my whereabouts, they should let him know." Anil Sharma said the sarcastic comments forced him to resign from the ministry, saying it indicated the chief minister had lost faith in him. "If the CM loses his faith in a minister, there are only two options: either the CM should expel him from the ministry or the minister himself should resign. So, I thought it better to resign from the ministry," Anil Sharma said. He clarified that though he had resigned from the ministry, he remains with the Bharatiya Janata Party. When contacted, BJP state president Satpal Singh Satti said the chief minister would decide on Anil Sharma' s resignation. "The CM is in Mandi today and will come to Shimla tomorrow. We will decide accordingly," he told PTI. The BJP expected Anil Sharma to campaign for Mandi Lok Sabha candidate, Ram Swaroop Sharma, who is contesting against his son Aashray Sharma. But Anil Sharma refused to campaign and even suggested that he was willing to quit the ministry over it. Even after his resignation, Anil Sharma said that he will neither campaign for his son nor BJP candidate Ram Swaroop Sharma.